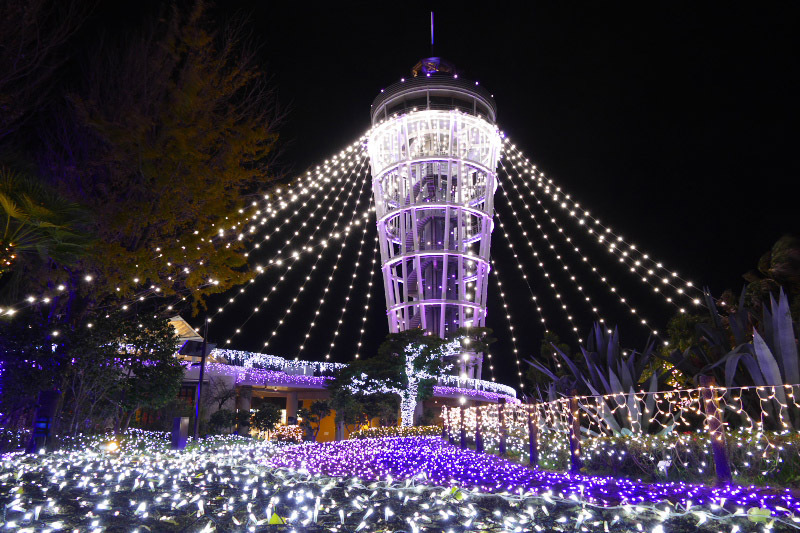 Every night of December to the middle of Febuary, Enoshima Island is colored with award winning outstanding large-scale illumination event in Japan. 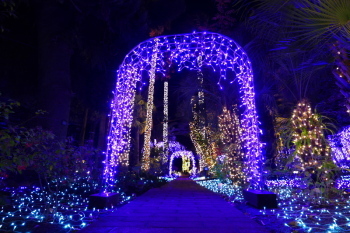 This must-see lights up event is mainly held at Samuel Cocking Garden and other major places in and around Enoshima Island. 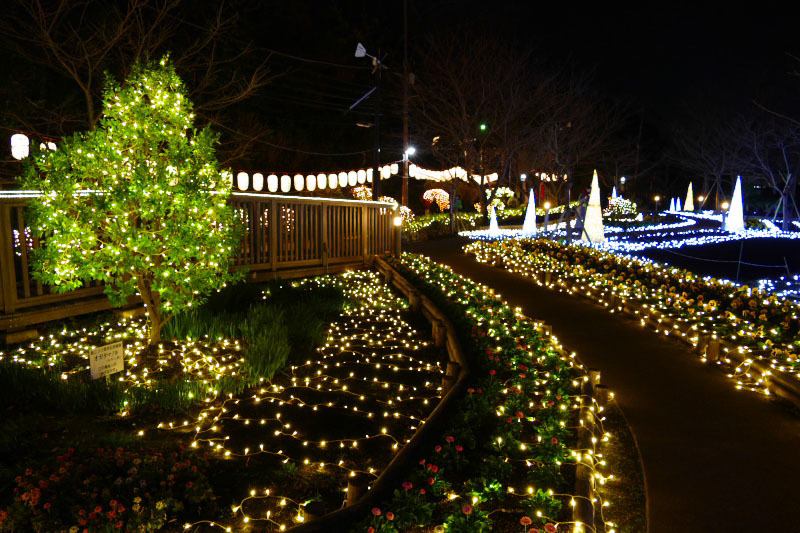 17:00 - 21:00 (9:00 pm) on weekend and December 23 - December 30. Where: Samuel Cocking Garden, Kamegaoka Square, Nakatsumiya Square, Oiwayamichi way, Ryuren no Kane (Hill of the Love bell) and Enoshima Iwaya Caves in Enoshima Island. 4 stations of Enoden Line (Enoshima, Kamakura Koko Mae, Hase, Kamakura) and Katase-Enoshima Station of Odakyu Line are also light up during the same period. 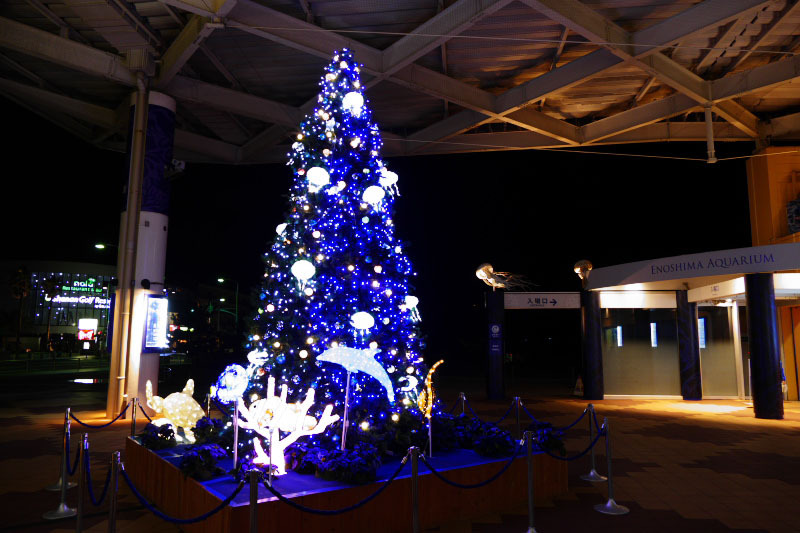 At Enoshima Aquarium, 6 meters high "Aqua Tree" which themed sea creatures, will be displayed at the entrance from Nobember 01 - December 25. 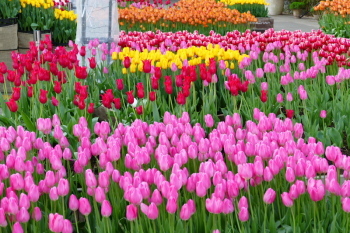 Admission: Free, but admission required to enter for Samuel Cocking Garden and Iwaya Caves. *It might be cancelled in case of heavy snow or too strong windy night. *Exhibit contents may vary depends on year. At the main venue of this light-up event, thousands of brilliant lights are colored and illuminated whole of the botanical garden. 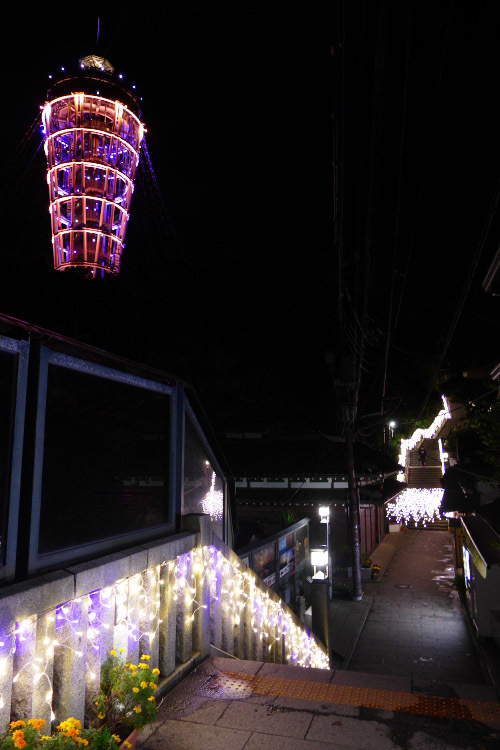 Many tall tropical trees are also decorated with colorful lights and it looks like the huge monsters stands in dusk. 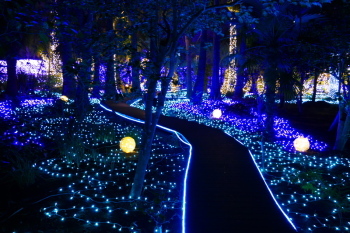 The illuminations are going on the deep into the woods and the forest turned into the sea of lights. 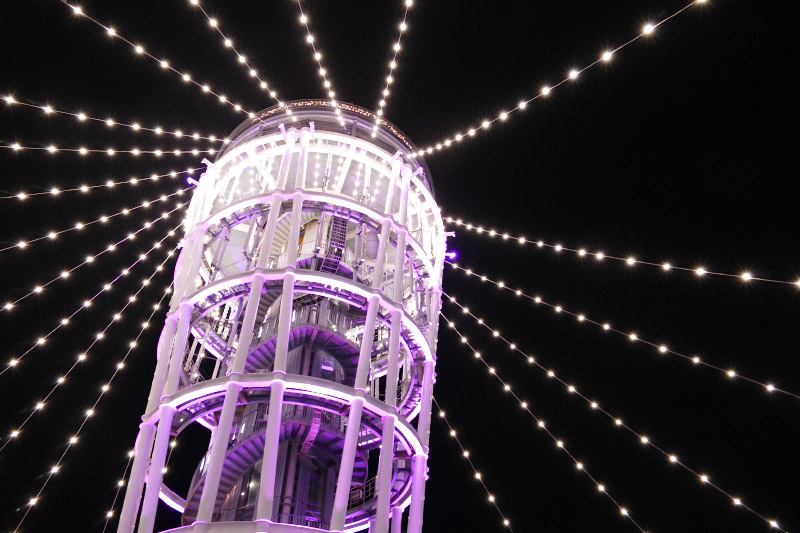 During the period of the event, Sea Candle tower is also specially decorated with lights. 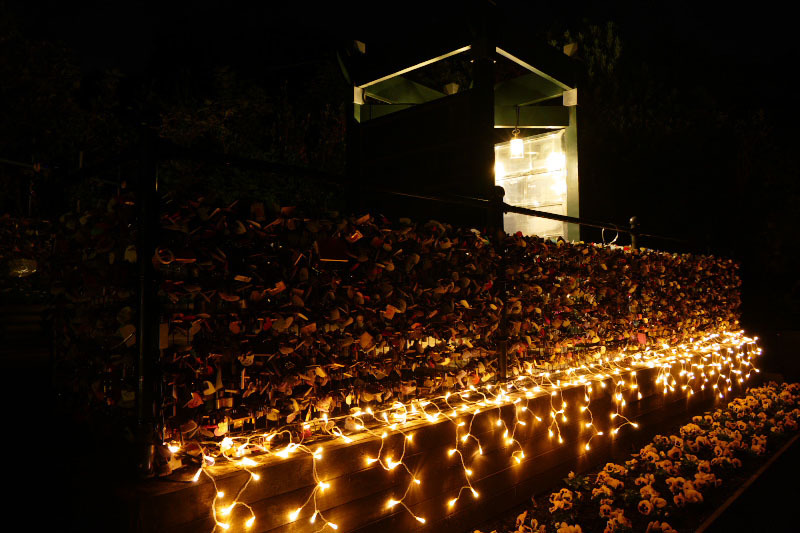 It seems that brightness increases more than usual. 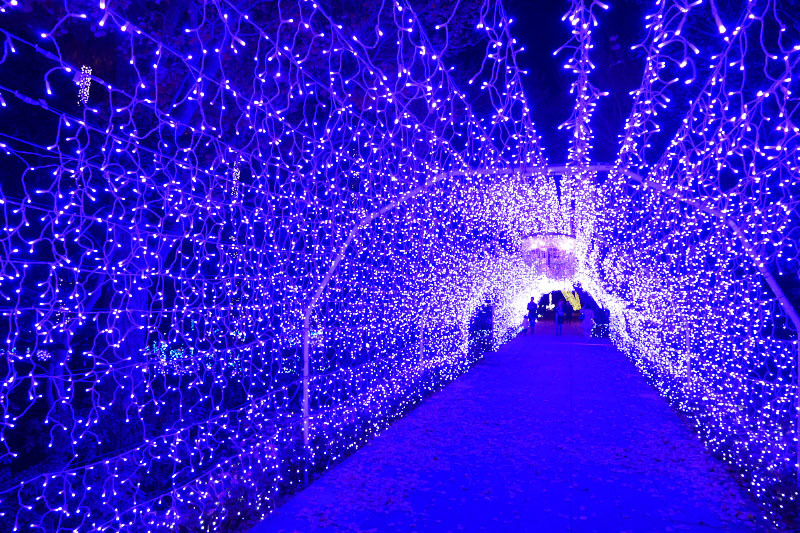 The blue-and -purple colored "Tunnel of Light" made of illumination and 70,000 pieces of crystal beads appears between the garden and Sea Candle tower. 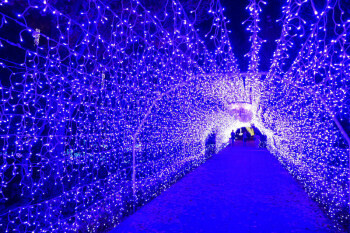 It is one of the most popular attraction with spectator every year. 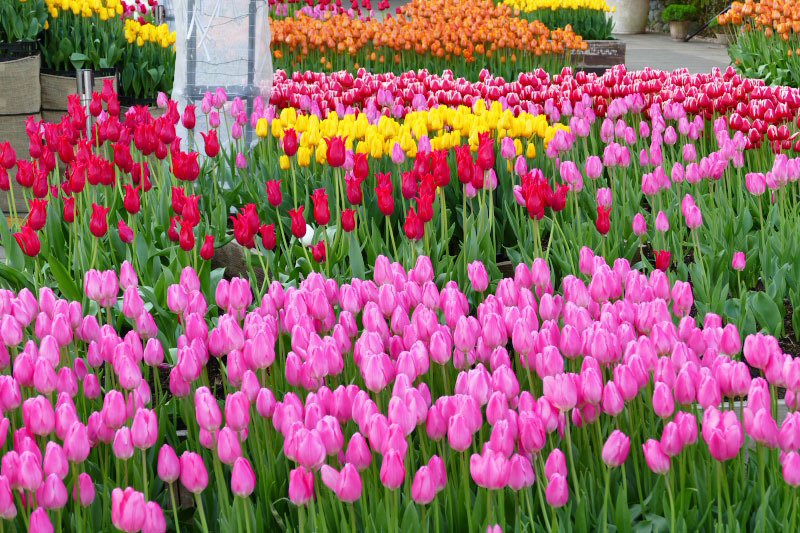 At the entrance of the garden, colorful tulips are in full bloom in spite of the mid winter days that is the coldest season throughout the year. 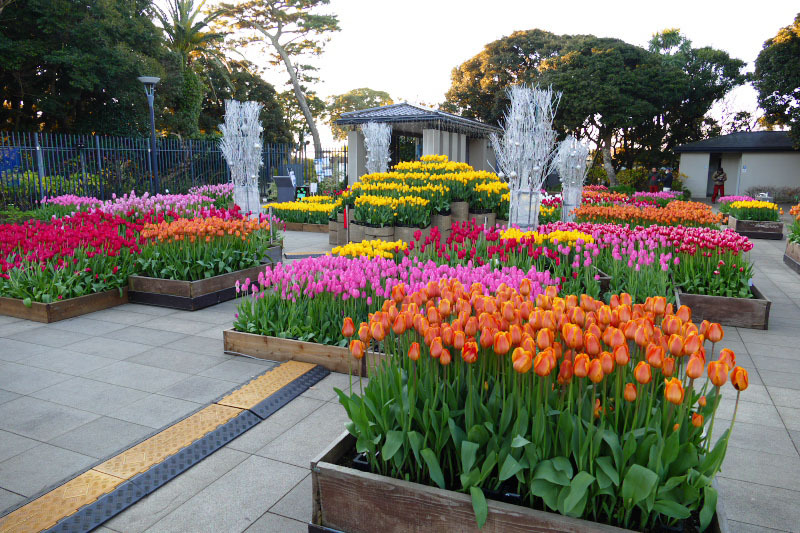 From the middle of December to end of January, 20,000 tulips planted in the flower beds and displayed here. 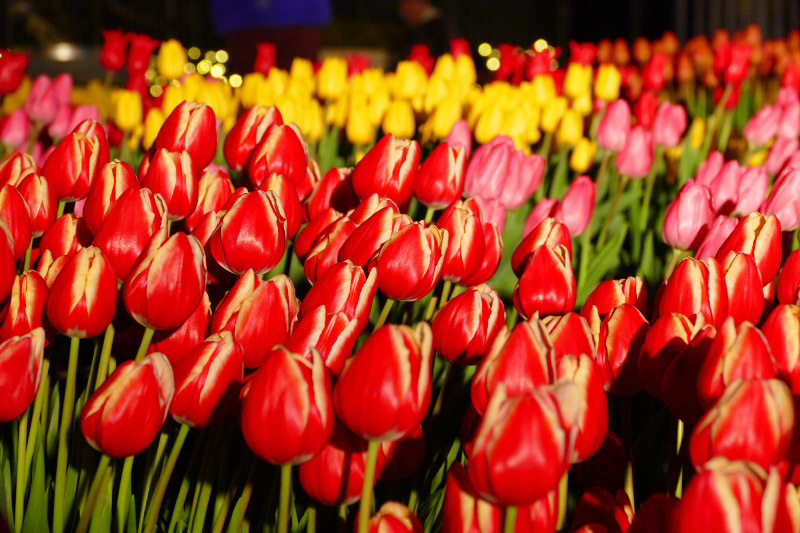 It is specially brought up to bloom in the middle of cold days in the winter. These tulips continue blooming for 1 month. 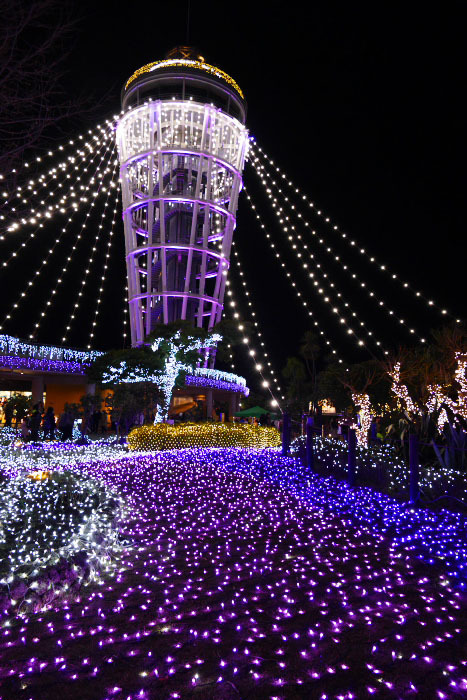 Decorations of this open square in the top of Enoshima Island is increased dramatically since 2015 and became the beautiful illumination covers the whole area exhaustively. 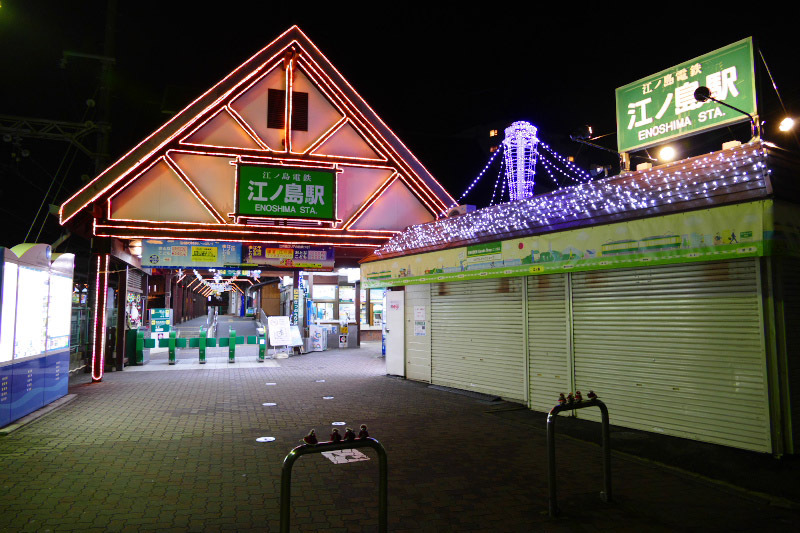 If you go into the lightful square, there is a welcome sign made with light. Mt.Fuji, dolphins, jellyfishes and yachts appears in the night dark. 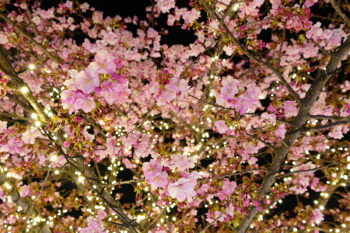 From the beginning of February, cherry trees (Kawazu-zakura, a kind of cherry that bloom earlier than standard cherry) are bloom flowers. 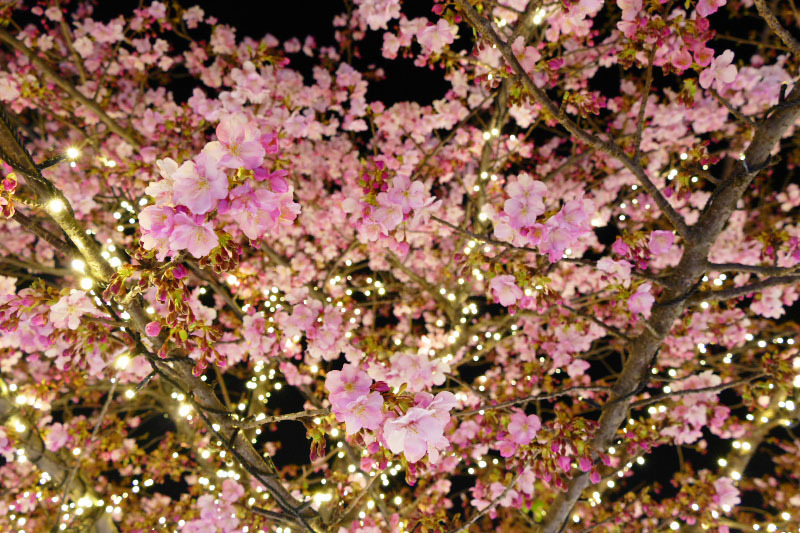 It might be the earliest cherry blossom illuminations [夜桜(Yozakura)] around Tokyo. 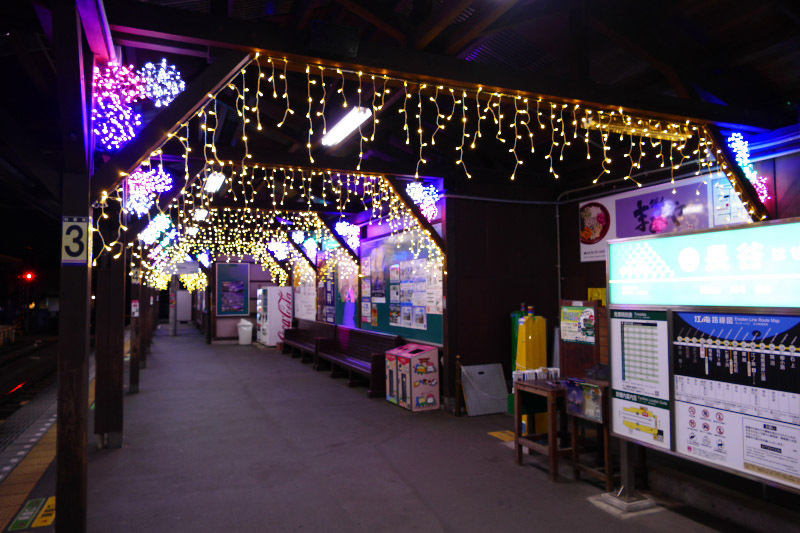 Decorations of the small square where is in between Enoshima Jinja Shrine Hetsunomiya and Nakatsunomiya Shrine was also upgraded in 2015. Some "Tree of Light" stands in the center of the square. 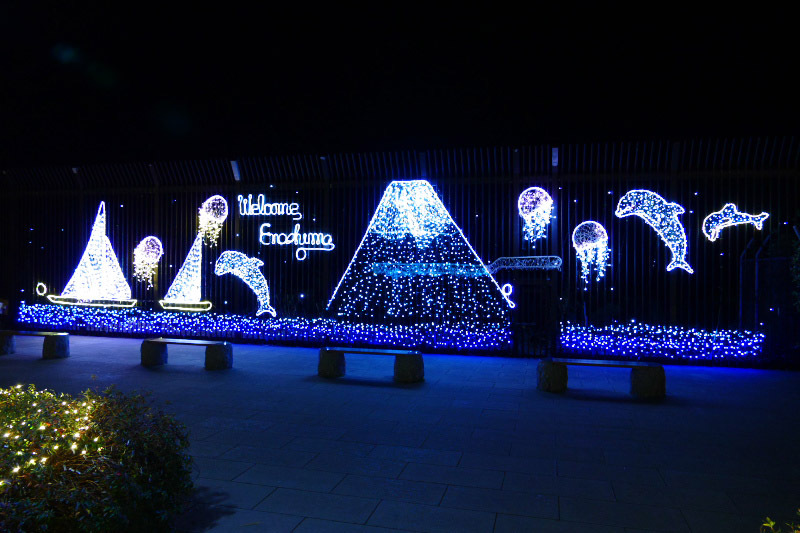 From 2016, Oiwayamichi way is added on one of the venue of this illumination event. 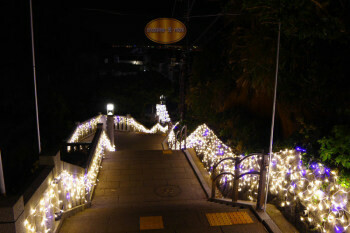 It means "The light path" appeared and it connects all the illuminaton spots in Enoshima Island. "Yama-futatsu" deep valley that divide the island also light up during the period. 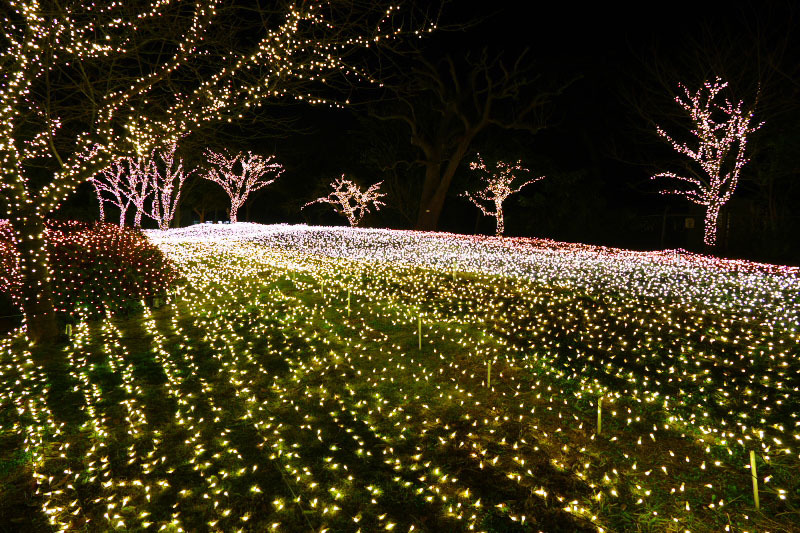 The line of the light dive into the deep valley is really impressive sight. 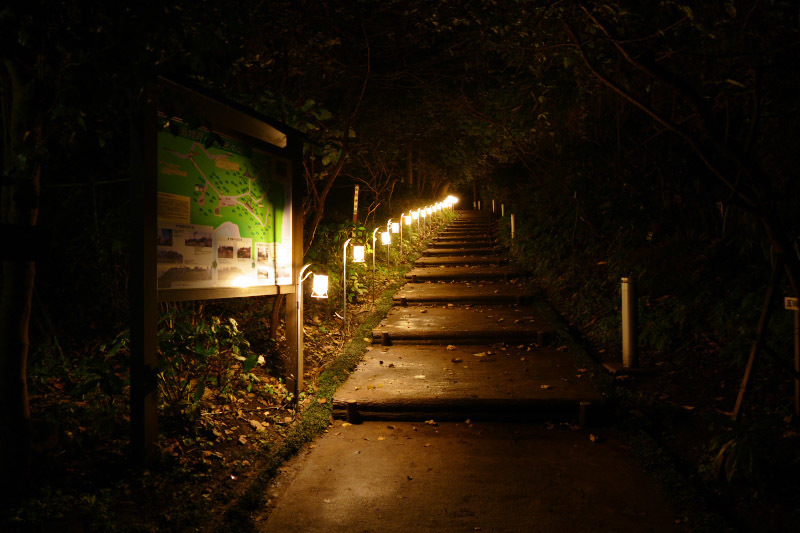 In the precincts of Okutsumiya Shrine, here is no special illumination display for the event. 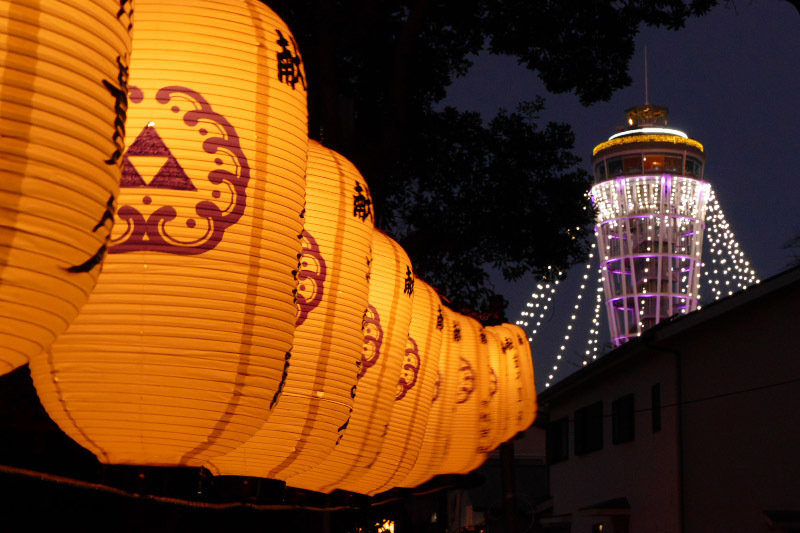 However, we can enjoy the costarring of the light with modern illuminations of Sea Candle and traditional Japanese style illumination that uses Chochin lantern during the year end and new year. 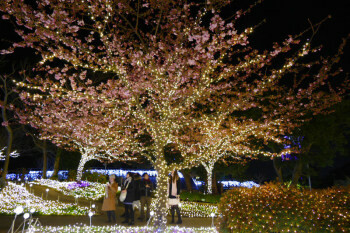 Ryuren no Kane (Hill of Lover's bell) is lighted up such as red, purple, blue and more at regular intervals. 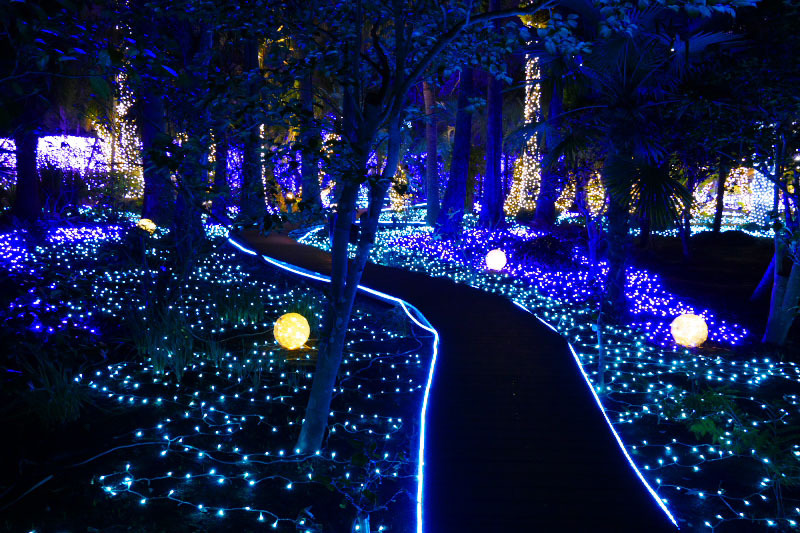 The lights placed in both sides of the narrow path leads you to the depths of the forest. The illumination spots are not only inside of Enoshima Island. Around Katase Nishihama Beach, where opposite to Enoshima Island, has some spots. 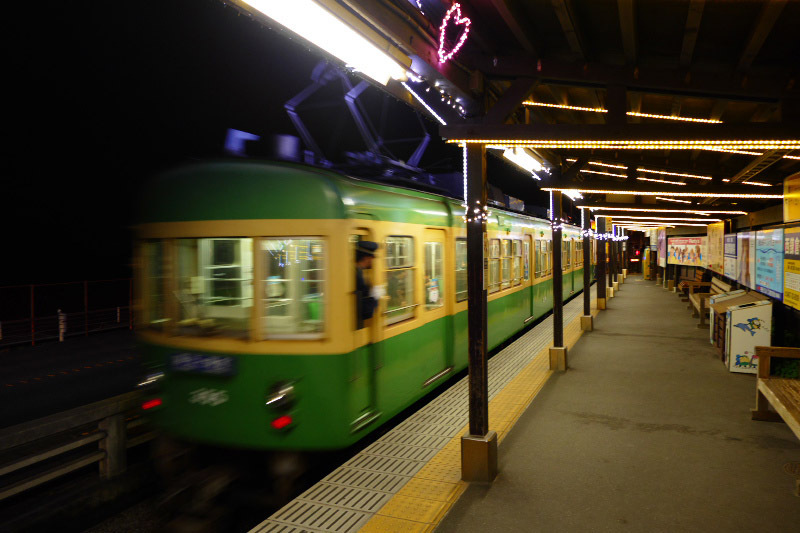 Katase-Enoshima Station of Odakyu Line, li-up from 16:30 to 22:00 every night until the mid of February, the same period of the event. At Enoshima Aquarium, 6 meters high christmas tree "Aqua Tree" which themed sea creatures displayed at the entrance until Dec.25. 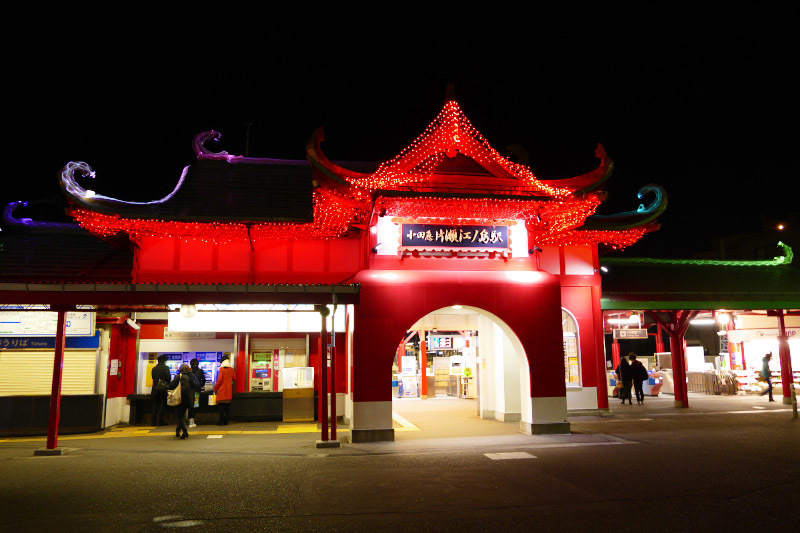 At Enoshima Station of Enoden Line, station building and platform are illuminated from 16:30 to 22:00 every night until the mid of February, the same period of the event. 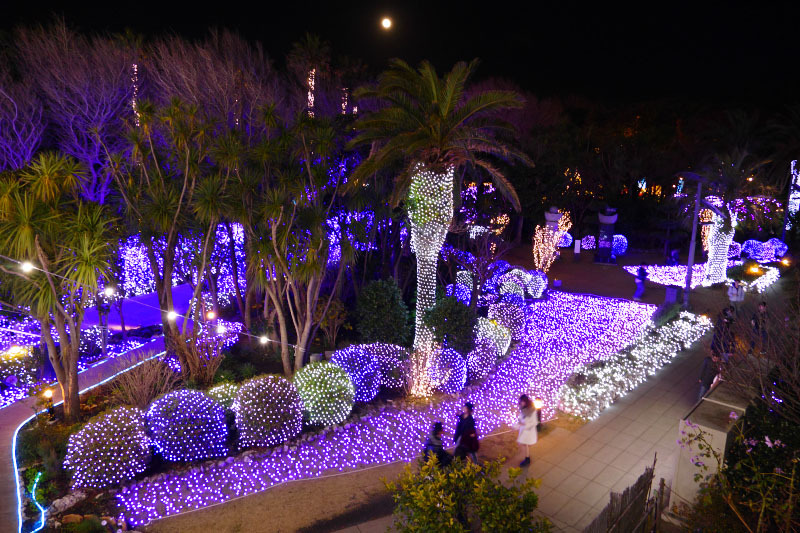 This light-up event has also held at Kamakura Koko Mae, Hase and Kamakura Station. 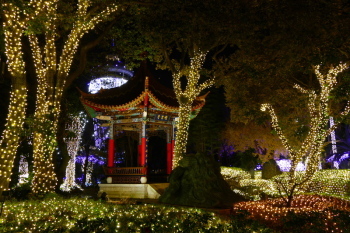 On the night of December 31(New Year's Eve), these illuminations turned on through the night.